ELL Enrollment is Increasing in Both the United States and Maryland. The enrollment of English Language Learners1 (ELLs) increased in both the United States and Maryland between 1998 and 2015 (Figure 1). However, the ELL population is growing at a faster rate in Maryland than in the U.S. While the share of ELL enrollment increased 3.3 percentage points in the U.S., it grew 4.9 percentage points in Maryland. If these upward trends continue, it is possible that Maryland may reach the national average in the upcoming years. Figure 1: ELL student population in Maryland and the US, 1998 -2015 2. Source: U.S. Department of Education, National Center for Education Statistics, Common Core of Data. Note: Maryland did not report data for 2005-06, 2006-07, 2007-08, and 2008-09; the line break represents missing data. Examining the languages spoken at home by the school-aged population provides a measure of the makeup of the ELL population in the U.S. and in Maryland. As shown in figures 2 and 3, the school-aged ELL population that report speaking Spanish at home is smaller in Maryland (51.70%) than in the nation as a whole (71.81%). In contrast, more than one fifth (22.76%) of the school-aged ELL population in Maryland affirm speaking other Indo-European languages, compare to less than one seventh (13.04%) of the U.S. school-aged ELL population. 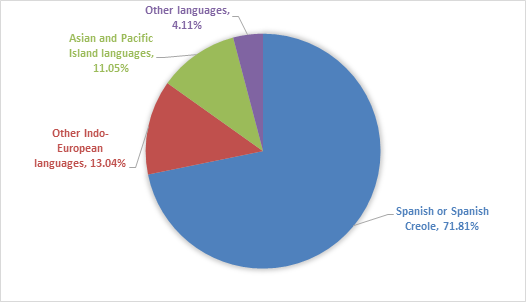 The proportion of school-aged ELLs who report speaking Asian and Pacific Island languages is 6 percentage points greater in Maryland that in the U.S. Figure 2: Languages spoken at home by 5-17-year-old, non-monolingual population in the U.S. Source: U.S. Census Bureau, 2010-2014 American Community Survey 5-Year Estimates. 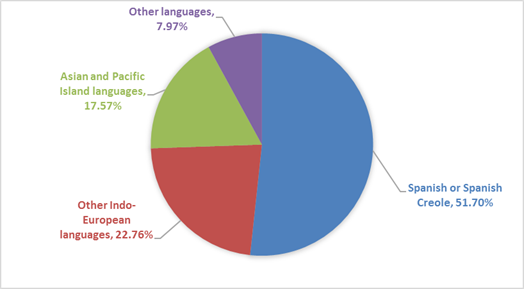 Figure 3: Languages spoken at home by 5-17-year-old, non-monolingual population in Maryland. Currently, Maryland is among the top 25 states with the largest proportions of ELL students in the United States (Figure 4). The states showing the greatest share of ELL student population are California, Texas, and New Mexico, which have historically hosted large immigrant populations. Notably, the proportion of ELLs enrolled in public schools is larger in Maryland than in other traditional immigrant destinations such as Arizona. These figures do not implicate that there are more students who speak a language other than English in Maryland than in those states. Instead, it means that, compared to Arizona, for example, Maryland has a larger student population who is being served in language assistance programs, such as English as a second language, transitional bilingual education, or dual language programs. Figure 4: Percentage ELLs enrolled in the public schools of the 25 states with the largest ELL populations, 2013-14 3. ELL Student Population is Unevenly Distributed in Maryland. 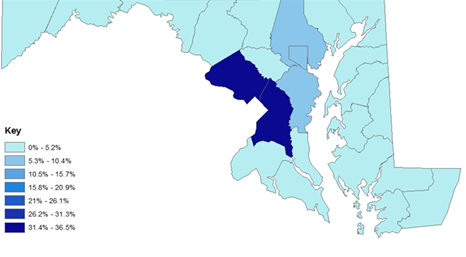 The ELL student population is not distributed evenly across the state of Maryland. Ninety-five percent of the ELL students are enrolled in eight school districts: Montgomery, Prince George’s, Baltimore, Anne Arundel, Baltimore City, Howard, Frederick, and Wicomico (Figure 5). Further, Montgomery County and Prince George’s County are serving more than two thirds (68.22%) of the ELL student population in Maryland. (See also, Appendix Table 1A). Figure 5: Concentration of ELL Student Population in Maryland School Districts 4. Nonetheless, the ELL student enrollment increased in every Maryland school district from 2000 to 2013 (Figure 6). The increase is most evident in Prince George’s County (9.47 percentage points) and Montgomery County (5.02 percentage points). Two other counties with large increases in ELL population are Talbot (4.31 percentage points) and Frederick (5.02 percentage points). Yet the share of ELLs in Worcester, Washington, Carroll, Calvert, Somerset, Charles, Cecil, Harford, Allegany, St. Mary's, and Garrett increased less than 1 percentage point in that thirteen-year period. Figure 6: Percentage of ELLs in Maryland public schools, 2000, 2010, 2013. ELLs represent one of the fastest growing segments of public school enrollment. ELL student enrollment in Maryland public schools more than doubled between 2000 and 2013, growing from 2.8% of total enrollment in 2000 to 6.5% in 2014. Given these recent demographic trends, it is very likely that the ELL student population in Maryland will continue increasing. For that reason, Maryland and school districts need to determine how to best serve this rapidly growing population. It is also crucial to analyze how ELLs are distributed across schools in order to allocate the kinds of resources they need and avoid racial or ethnic segregation. Understanding these demographic trends and meeting the needs of these culturally and linguistically diverse student populations must be a priority for both educators and policymakers. 1 English language learners are those students who speak a language other than English at home and are served in programs of language assistance (e.g., English as a second language or bilingual education). In the 2001-2002 school year, the National Center for Education Statistics (NCES) opted for using the term English language learners (ELL) instead of Limited-English Proficiency, which had been employed in previous school years. 2 The NCES began reporting state- and school-level data on the enrollment of ELLs in 1998; however, not all the states report data every year. In fact, the only two school years in which every state reported ELL data were 2009-10 and 2013-14. 3 The school year 2013-14 was selected for the analysis because it is the most recent year in which all the U.S. states reported data on ELL population. To maintain consistency, the analysis of the district-level data focuses on the same school year (2013-14). 4 Erin Janulis, a research assistant at the Maryland Equity Project, created Figure 5 using GIS Mapping Software©. Appendix Table 1A: Concentration of ELL in Maryland School Districts. Angélica Montoya Ávila is a research assistant at the Maryland Equity Project and a first-year doctoral student in Language, Literacy, and Social Inquiry in the Department of Teaching and Learning, Policy and Leadership. She holds undergraduate and master’s degrees from Universidad Nacional de Colombia.